McCall’s 5978 is done! Finished! Wearable! WooHoo! This is the first item of clothing I’ve sewn from scratch in 2 years. I went back and re-did the hem on both front corners, it looks much better now. I ended up using just simple gray buttons, the fabric is so busy that I didn’t think fancy ones would stand out. The buttonholes were a Pain in the ….. to put in. I did samples on some scraps, selecting the correct size. Hmmmmm. instead of 20 mm, they came out 25 mm. – way to big! Tried another sample with it set to 16 mm, and it ended up being 19 mm, just right. I sewed the first buttonhole. The first side went OK until I got toward the end toward the edge of the jacket, and c.r.a.p.!!!! Between the seam allowance and the fabric, it ended up at too short. At least I checked it before cutting it open. So I removed the stitching and went to bed. After thinking on it, I basted some interfacing to the front (which had no interfacing as per instructions), basting as close to the buttonhole locations as possible. This time I had my trusty awl handy to help flatten the seam allowances, and SUCCESS! So I finished the buttonholes, cut them open, sewed on the buttons, and gave it a final pressing, and it’s hanging in the closet waiting to be worn. I know I’ve mentioned it in the past, but thanks to all of those who take the time to write their blogs and on places like Stitcher’s Guild and Pattern Review. It’s given me courage to start sewing clothing again. Tracing patterns on Swedish Tracing Paper has been *one* of the best hints, as now I just merrily start slashing, adding, removing bits as needed, and I can try it on without worrying about tearing the pattern. 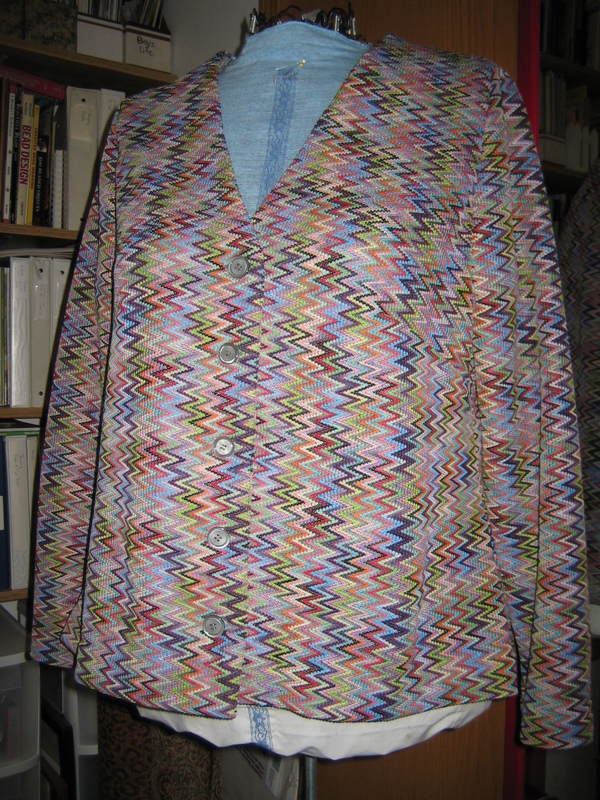 Up next – I have Burda 8339 jacket traced and ready to be modified. I’ll be making it out of brown corduroy. This entry was posted on January 3, 2010 at 7:07 pm and is filed under sewing. You can follow any responses to this entry through the RSS 2.0 feed. You can leave a response, or trackback from your own site.